Helene and I chat about her upcoming webinar on intact dogs, and talk about arousal, pressure in training, and the difference between static and dynamic impulse control. Ever wondered what the benefits are to canine massage? Lori Stevens joins me on the podcast to talk about how canine massage can benefit our dogs. 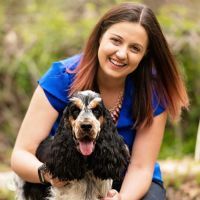 Chrissi Schranz shares how you can find time to train your dog while still successfully tackling even complex behaviors... often without even leaving your couch.